On the other hand, if you're trying to change the color of the blue frame that's displayed to show you the bounds of the text frame, I don't think you can do that. Actually you can. If you put the object into a layer, then right-click on the layer in the Layers panel, there is a menu option Properties. That lets you set a layer colour which tools will use for all objects in that layer. 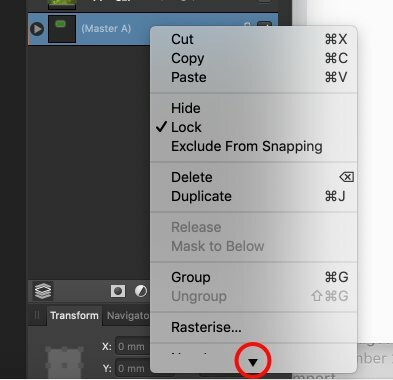 If you put the object into a layer, then right-click on the layer in the Layers panel, there is a menu option Properties. You can also create a layer yourself clicking on the 5th icon (left to right) on the bottom of the Layers panel. If you are not seeing the Properties entry in the contextual menu on the layer created by the master pages when you right-click on it, click the small arrow on the bottom of that menu (it should display one there - see screenshot below) to expand/show the rest of the entries. It might be helpful to also add this option to layers created automatically by Publisher like when adding a text box, etc, and change the colour later. It seems to me that this is the way layers are added to Publisher most naturally.